Making the transition from Orca Orca to Lost Film in 2014 with Demo, a clutch of home recordings, Northampton, Massachusetts’ Jimmy Hewitt is the project’s lone constant. Imago, Lost Film’s debut LP, was released in 2015, followed by this January’s Temporary EP. 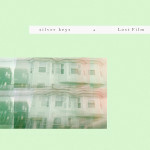 New single “Silver Keys” exists as a one-off outing with Hewitt’s Lost Film touring band, conceived and recorded at Converse’s Rubber Tracks studio in Boston. Bounding, with lush melodies, “Silver Keys” is a fluttering rumination on the intersection of past and present. To be pressed on demand as a 7″ square lathe cut vinyl for one week only, you can stream “Silver Keys” below and pre-order the single via The Native Sound before 28 March.